Devon Really Does Care – Does your county ? Devon is the third largest county in the UK and has an older than average population. With so many elderly people living here, why am I still pleasantly surprised when I discover establishments that bend over backward to welcome them as visitors. I telephoned Killerton House recently with regards to a small coach party of very elderly people who would be visiting simply for a coffee. Absolutely nothing was too much trouble. Not only were they invited to have coffee in the main Killerton Kitchen restaurant without having to pay for admission, I was also told the coach could drive up to the entrance to drop off the frail passengers. 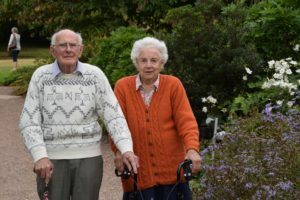 I decided to pop over to Killerton myself and many elderly visitors were delighted to share just how well they had been taken care of, and how absolutely nothing was too much trouble for the staff. Arriving at the car park, there are blue badge allocated parking spaces and disabled access toilets. Then there is a multi-seat, volunteer driven golf buggy to transport people with reduced mobility from the entrance to the house. This same vehicle can then be used to visit the Chapel and stable block. and staff are more than willing to aid visitors who are able to attempt stairs but would feel more secure with someone there for support. Another popular attraction is Darts Farm, near Topsham. They are also extremely welcoming to elderly customers, especially for those who may only pop in for a morning coffee. They also have a wheelchair lift to the first floor Orange Tree shop floor. They also have disabled access toilets available in the shop. Lastly today, I am mentioning the Ridge Café in Haldon Forest. The owners are extremely welcoming to their elderly visitors and once again there are disabled toilets, clear signage, grab rails and all manner of other useful aids to someone less able. If you work somewhere that actively welcomes elderly visitors, and you go over and above to accommodate their needs, please contact me by email and I will feature your establishment or business.